Reader Marie Clements snapped this image of an unusual notice, spotted in Crystal Palace Park today. 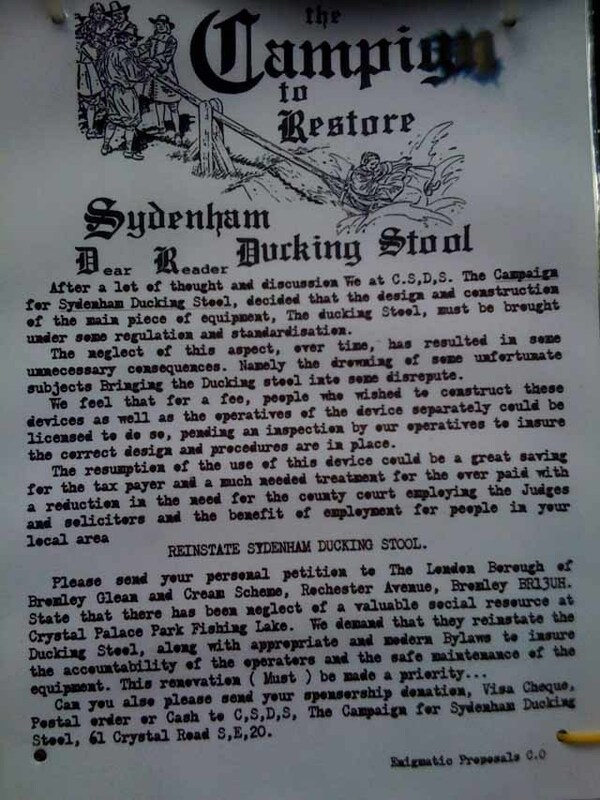 The sign purports to come from the CSDS, or the Campaign to Restore Sydenham Ducking Stool. The slightly confused text seems to implore both the return of ducking equipment and its proper regulation. The last recorded use of a ducking stool in London, according to Chambers Book of Days, occurred in Kingston in 1745 when a female ale house keeper was dunked in the Thames for 'scolding'. The CSDS suggest the device might be reinstated for use on the 'over paid'. Anyone got information on who's behind this? And who would you like to see ducked in Crystal Palace Park Fishing Lake?